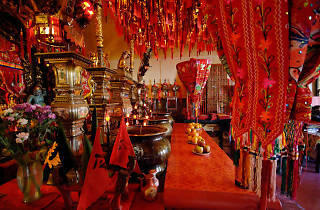 Claimed as the oldest Chinese temple in the US, this is a shrine to Tien Hau (or Tin How), the Empress of Heaven and Goddess of the Seas. It was established by early settlers who, revering the Goddess as the guardian deity of seafarers, believed that she had guided their passage across the Pacific. 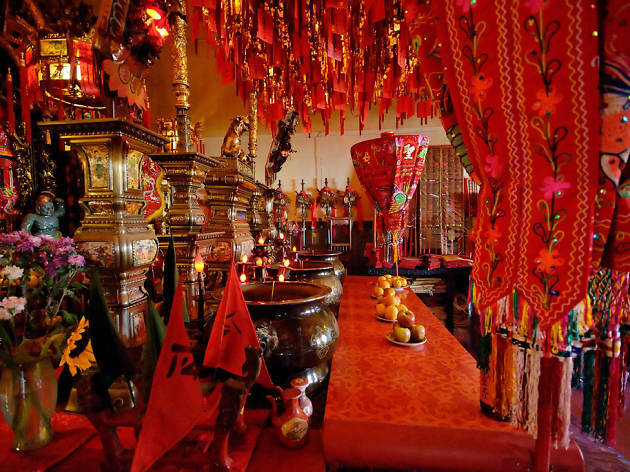 Located on the fourth floor of a building tucked into Waverley Place, the small temple has a reverent hush, is engulfed in the scent of incense and is hung with hundreds of glass lanterns in front of the shrine, each with a red prayer card hanging from it. From the balcony, you can see the top half of the TransAmerica pyramid right in front of you, and the Coit Tower to the north. Photography is not allowed inside the temple, and you should ask a member of staff before entering.